An invention in the area of satellite construction by the University of Applied Sciences and Arts, Northwestern Switzerland FHNW, with support from its industrial partner, RUAG Space, has been awarded the 2016 YPSOMED Innovation Prize—the automation process subsequently developed on the basis of this invention contributed to RUAG Space acquiring a major project. The 2016 YPSOMED Innovation Prize went to the development of the “GreDom-Insert.” This is a novel kind of insert that is installed and bonded in satellite panels fully automatically. These are special thread inserts which allow instruments, assemblies and sensors to be attached to the load-bearing structure of a satellite. An average communications satellite has between 5,000 and 10,000 inserts, which have had to be installed manually up to now. Based on the “GreDom” insert developed at FHNW, and on the findings of this research project funded by the Commission for Technology and Innovation (CTI), RUAG Space then designed and built the “Automated Potting Machine.” This automatically cuts panels to size, drills holes, applies adhesive and places the inserts into the panel with a high degree of precision. The manufacturing time for satellite structures can thus be significantly reduced, enabling considerable cost savings. Sandwich panel with inserts as part of a satellite structure. 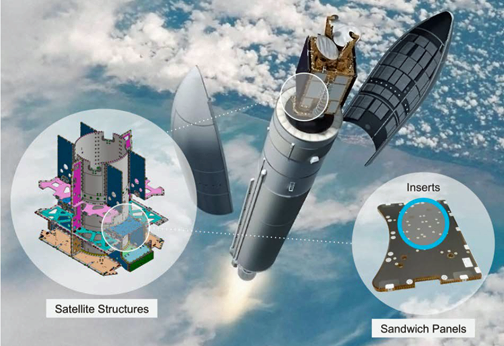 Image is courtesy of RUAG Space. This revolutionary invention provides an instant benefit for the industrial partner RUAG Space. “The fact that we have been awarded the contract to construct the OneWeb satellite structure is partly due to this automated manufacturing process. Our efficiency means we stand out from the competition,” according to Urs Breitmeier, CEO of RUAG. For this major project, a total of 900 satellites should provide blanket broadband Internet by the end of 2020 and this is the largest series production in the history of satellite construction. Product development for the space industry is one of the FHNW School of Engineering’s focus areas. The School's 14 institutes work closely together with the business sector on applied research and development. The inventors of the revolutionary “GreDom” insert are Prof. Gregor Burkhard (FHNW) and Dominik Nägeli (previously FHNW, now RUAG Space). Their invention was developed further by the project team with FHNW researchers Laurent Repond, Marcel Gloor and Stefan Kobler, under the leadership of Prof. Hans-Peter Gröbelbauer (FHNW) and Stefan Kögl (previously RUAG Space). The research project was funded by the Commission for Technology and Innovation CTI. The YPAOMWS Innovation Fund Foundation aims to motivate creative and innovative teams or individuals to incorporate the needs of industry and services in their academic work. The projects presented should therefore contain innovative, financially feasible ideas, products, procedures, methods or services. Together with the award, the winner of the YPSOMED Innovation Prize receives CHF 30,000 in prize money.